Some users may find that Task Manager is blocked on their system. 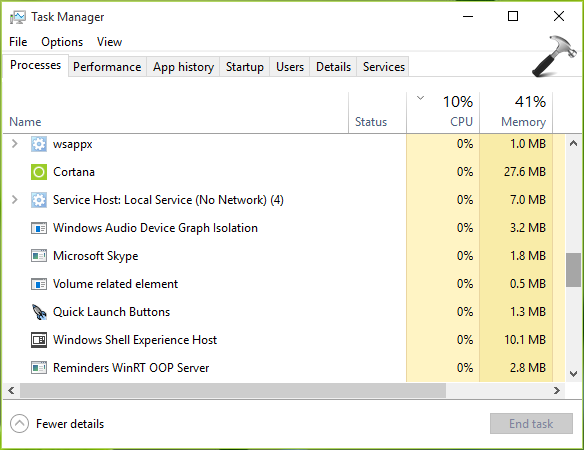 In this post, learn how to fix, if you can't open Task Manager in Windows 10/8.1/8/7. Task Manager can be usually opened by right click and taskbar and selecting Task Manager in the context menu so appeared. Windows 10 users may access it from Win+X menu as well. It helps you to track process and services on Graphical User Interface (GUI). But sometimes users may face the issue that they can no longer launch Task Manager. In such as case, they won’t be able to quite programs that are no longer responding. Additionally, it is not possible to analyze disk/memory usage, check the app usage analytic etc. Since the Task Manager is no longer visible, you won’t be able to analyze system performances. However, there are alternative ways to access Task Manager but depending upon the depth of issue you’re facing, you may not able to either ways. So here are few suggestions worth to try, in order to make Task Manager accessible. See if they helps you. 1. Sometimes Task Manager might be blocked by third-party antivirus tools you use. So if you’re using any of such programs, completely uninstall them for a while and check the status of the issue. 2. Task Manager executable file is located under C:\Windows\system32 by the name taskmgr.exe. You may try accessing it from there, this might help to open Task Manager. 3. Task Manager is dominated by system file and if there is a system file corruption, you may have trouble accessing the tool. So run the System File Checker scan and fix the possible corruption. Don’t hesitate to take help of DISM inbox corruption repair commands as well. 4. If any third-party tool is blocking Task Manager, simply rename the taskmgr.exe file to any arbitrary name which the third-party tool may not recognize and see if you open it then. 5. Press CTRL+ALT+DEL keys and select Task Manager. You may also try CTRL+SHIFT+ESC key combination as well, to bring Task Manager. 6. Press + R to open Run, type taskmgr and click OK. Alternatively, execute taskmgr.exe command in Command Prompt or Windows PowerShell. 7. If you still have the issue, Refresh Windows 10 or perform in-place upgrade. Either ways won’t affect your data. Related: Task Manager has been disabled by your administrator. 2nd step under “Fix: Can’t open…” helped me to run it. Also I made a shortcut from there! Thanks! Also, check that you don’t have multiple displays attached to your graphics card and either have the other display switched off or unplugged.